Turkey’s longstanding EU membership negotiations have been periodically delayed by reluctance from Member States, lack of progress in meeting the accession criteria and more recently deteriorating democratic institutions, write Renke Deckarm and Torsten J. Selck. They suggest that the refugee crisis has motivated the EU to advance the negotiations, despite these circumstances, in exchange for help from Turkey in managing the situation. Turkey has been a frequent subject in recent headlines. A bomb attack in Istanbul, the downing of a Russian warplane and the Turkish presidency of the G20 have dominated press coverage over the past few weeks. From a European perspective, the deal reached between the EU and Turkey in late November is particularly interesting. Turkey has committed to reducing the number of refugees crossing its border into Greece, while the EU will give Turkey €3 billion in support – and at the same time accelerate negotiations for EU membership. Turkish EU membership? Wasn’t Turkey not that long ago the longstanding candidate country without a real prospect of ever actually join the EU? Negotiations between Turkey and the EU date back as far as 1959. After substantial Turkish reforms in the early 2000s, official negotiations were opened in 2005. So far, however, only one of the 35 negotiation chapters has been completed and 16 are currently frozen due to multiple concerns. Most importantly, Turkey does not recognise the Republic of Cyprus, which is an EU member. The Kurdish conflict and human rights related issues are also repeatedly mentioned as impeding the negotiation process (or does culture matter after all?). Since 1998, annual progress reports from the European Commission critically assess progress and shortcomings for each candidate country. The response to the Commission’s latest progress report on Turkey resulted in a surprising shift in the previously deadlocked negotiations. The report, published in early November, is the eighteenth of such reports on Turkey, which are prepared by the Commission’s Directorate General for Enlargement. The 92-page report gives a comprehensive overview of Turkey’s progress towards meeting the EU’s strict accession requirements, the Copenhagen Criteria. This report is no exception to its predecessors, highlighting a number of negative developments in Turkey. In recent years, former Prime Minister and current President Recep Tayyip Erdogan has tightened his grip on power. The worsening situation of the independence of the judiciary and the freedom of press, speech and assembly was visible in forceful clampdowns on citizen protests in Istanbul. Consequently, Turkey’s progress on freedom, democracy and human rights has been judged negatively by independent observers. This year has seen attempts by Erdogan’s ruling AK party to change the constitution in order to strengthen presidential powers vis-à-vis other political actors in Turkey. Parliamentary elections in June did not return a majority for AKP, although it was the largest party. It did not form a coalition and instead, arguing that the people mistakenly did not give it a majority, pushed for fresh elections. New elections held on 1 November 2015 gave AKP a majority once again. The election campaign was marked by suppression of opposition actors. The Kurdish peace process also came to a halt and armed conflict returned to Turkey’s eastern regions. Some suspect that this development might be a consequence of the success of the Kurdish-dominated HDP at the elections in June. The publication of the Commission’s progress report was in fact delayed. It has been suggested that this was a first concession to Erdogan. The report was published swiftly after the elections, one month later than the usual date. The Commission has forcefully denied this and further suggestions that the report’s conclusions were softened in exchange for enhanced cooperation from Turkey on refugee flows. The report itself was critical of Turkey’s lack of progress toward EU membership. As part a planned project at Oldenburg University, we have begun analysing Commission progress reports using a quantitative text analysis method called Wordfish (see the paper introducing the method). Since Turkey is a particularly interesting case, we are presenting a preview of our results, which include the most recent report. Figure 1 shows the results of our analysis of all progress reports on Turkey. 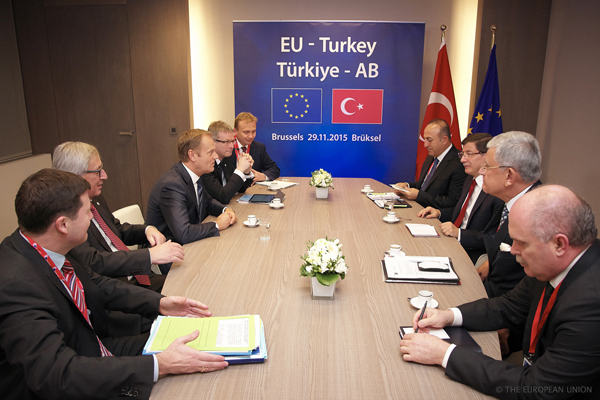 The curve tracks the actual progress made in the negotiations between Turkey and the EU. The underlying dimension seems to be whether Turkey is making progress or not. Positive values are associated with progress, while negative values are associated with a negative development. The greatest improvement took place in the mid-2000s, during the period of substantial reforms in Turkey mentioned. After this phase, Turkish eagerness for reform was hampered by the fact that its EU membership bid lost support in European governments. Most prominently, then French President Nicolas Sarkozy (elected in 2007) and German Chancellor Angela Merkel (elected in 2005) were both opposed to Turkish accession. Combined with many domestic factors, this led to a cooling of Turkish efforts to join the EU. 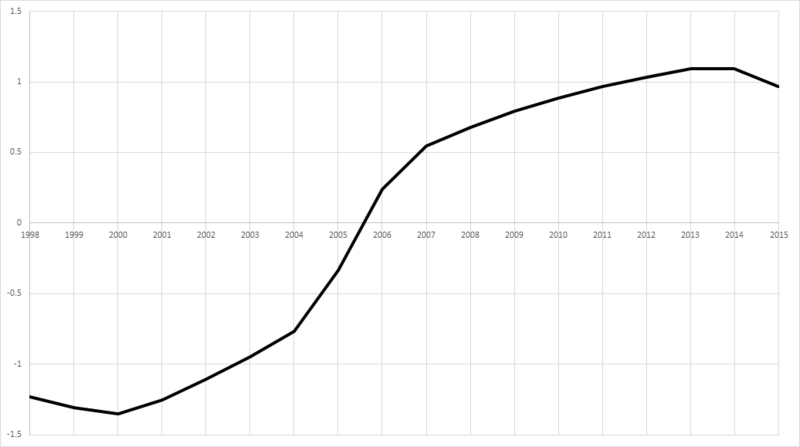 The progress reports, as displayed by the curve above, reflect these developments. The actual progress in the negotiations up to now would follow the line above. The negotiations were opened in 2005, but many chapters were frozen between 2006 and 2009, leading to a practical standstill in the negotiations. But what about this year? The latest progress report is the first in years to give a negative view on Turkey, as recent developments would suggest. Normally, this would translate into a further slowing down of membership negotiations. This year, however, the negative outlook has been largely ignored and negotiations have in fact been accelerated. A chapter could be opened in the remainder of 2015, and more are envisioned for 2016. EU leaders have decided not to recognise Turkey’s progress in fulfilling the accession criteria, but rather to use enlargement negotiations as a bargaining tool for Turkish support in managing the refugee crisis. This brings back old questions for the EU and its Member States. Is the EU a normative power, spreading democracy and human rights in its neighbourhood? Or are these values flexible where deemed necessary to suit the EU’s interests? Will the demands placed on Turkey for EU membership be lowered in light of its role in the migration crisis? Recent developments indicate that the EU is moving in the direction of flexibility vis-à-vis Turkey. The weeks and months ahead will show whether this trend continues. Renke Deckarm is PhD Candidate in Politics at the University of Oldenburg. His research interests include the organisational design of European institutions, EU politics more generally and quantitative research methods. Prof Torsten Selck is Professor of Political Science at the University of Oldenburg. His expertise rests in political decision-making and institutions, focusing on the EU context, in addition to constitutional and legislative politics, public policy, foreign policy analysis, and negotiation and bargaining.